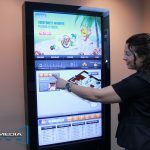 Interactive Digital Signage: Why Should You Get an Interactive Wall? Have you ever asked yourself about the benefits that a LCD interactive wall display can bring to your business? In today’s post, I’d like to tell you about this amazingly impactful solution and the benefits that it can bring to your business. Marketers are always on the hunt for the latest and greatest technology to set their company apart and provide greater opportunities to attract and retain business. With increased competition companies are forced to be more dynamic in their efforts and tasked to find unique ways to stand out above their competition. Video walls are just that avenue to achieve the concept “Go Big, or Go Home” and make a positive difference to their bottom line. Built with the ability to show content differently on each screen or tiled across all screens, the possibilities with video walls are endless. 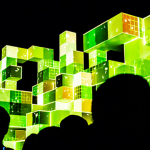 So you’re probably wondering what are some of the reasons for a video wall? Well let’s go through some of them. Branding: With a video wall you can visually expose your brand in a large scale and memorable format. 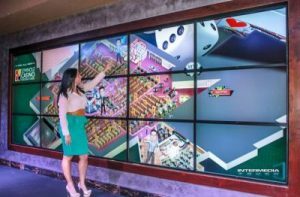 For example, Seminole Casino Coconut Creek uses an interactive video wall in the center of their casino where there is high foot traffic. Patrons walk by and not only get a “wow factor” but they also see the current promotions, special events and campaigns that the casino is offering!Seminole Casino Coconut Creek is taking advantage of the true advertising power of their video wall to communicate its brand, and provide their players with a unique and interactive casino promotional experience. Enhance Ambience: Provide a greater customer experience by enhancing the ambience of your business though a video wall. How does this happen? You can use a video wall to provide an educational experience during your customers dwell time. While your customers are waiting why not educate them on all of the exciting things you have to offer. Also, use your interactive wall to provide a visually stimulating piece of mobile art in your business that is dynamic in content and impressive by design. Improve quality of work and service: How about improving the quality of work? For example, Miami Children hospital acquired a interactive video wall from Intermedia Touch and improved the communication within their hospital. Doctors are now able to have teleconferences with other healthcare professionals from around the world. When they are not using the video wall to teleconference, it is used to display relevant content for its visitors. Reduced printing costs: By having a video wall to display all your advertising, branding, game, and educational content you can save on the traditional printing costs that reoccur month after month from traditional advertising. Digital signage has many uses and marketing purposes. From gaming in a casino to video conferencing in a hospital, the use of a interactive wall is limitless. That is why it is important to understand what you want to accomplish with your new digital signage project.